Congratulations Prep – we have successfully crossed the finishing line of the first academic term of 2019! We can definitely celebrate our goal of ‘Creating Champions’ as there have been an abundance of ‘gold medals’ awarded in all three phases of our school, namely the Reception Unit, Junior Primary and Senior Primary. Further ‘gold honours’ have also been achieved in the extra-mural activities and cultural programme which has highlighted the success of the term. However the prize trophy that we can really celebrate and raise is the positive ‘synergy’ in general that we as a school have enjoyed on a daily basis – there have been so many positives and rewards to focus on that have far outweighed any challenges or negative obstacles that may have been there to overcome. Will we have to pick up the pace during an action-packed second term? – most definitely yes – but after having set the desired pace and standards this term, we as a Prep team are well prepared to celebrate even more rewards during the next challenge. I have in previous Prep Patters elaborated on the new facilities that we have been working on throughout his first term. You will have read about and noticed the developments taking place in the DPHS Learning Support House in Claribel Road, the Music House in the Annex Section across from the back gate, the DPHS Uniform Shop created in the new premises, as well as the renovations taking place in the old tuckshop facility transforming the venue into a ‘coffee/tuckshop” facility. We can all look forward to an official function to launch these combined services for DPHS, early in the second term – facilities that we will be extremely proud of. It is at the end of this term that we now pay our respects to Mrs Debbie Rautenbach who has served in the Tuck/Uniform shop for the past 4 years. Mrs Rautenbach has to be complimented on her dedicated and loyal service noted during this time for which we as the Prep community acknowledge her and the team she has worked with. Although she will be leaving the ranks of the DPHS staff, she will not be lost to Prep as Mrs Rautenbach will now be employed under the ownership of the new DPHS Uniform Shop – this position has definitely warmed the hearts of our Prep community. Thank you Mrs Rautenbach for your passion, energy and professional service that has been given to our school. I would also like to place the spotlight over the entire DPHS team of staff, educators, coaches and general assistants/maintenance team for their outstanding commitment given to our school and the boys in particular throughout term 1. If you had to sit with your year planner given at the start of this year you too will be amazed at the jam-packed calendar of events which the staff team have been directly involved in. This Prep Team stand tall and united in providing for our school and for this loyalty and professional guidance noted daily, I call on all DPHS families to loudly applaud the efforts of our ladies and gentleman. A proudly Prep effort – congratulations staff! Our ten staff members who attended the IBSC conference returned from their staff development held at Pretoria Boys High ready to share their information with the staff. These opportunities are always so beneficial as our staff can sit amongst international guest presenters on educational matters practised amongst leading schools around the globe. Listening to this feedback presented by delegates relating to the conference theme of “ The world behind our boys” has really inspired our staff to maintain our excellent standards as well as to initiate new visions expressed throughout the conference. I share this information to emphasise how our staff are committed to our Prep call of ‘developing our boys for life’ in the classroom, extra mural programme and in their basket of life-skills and values. Thank you staff! 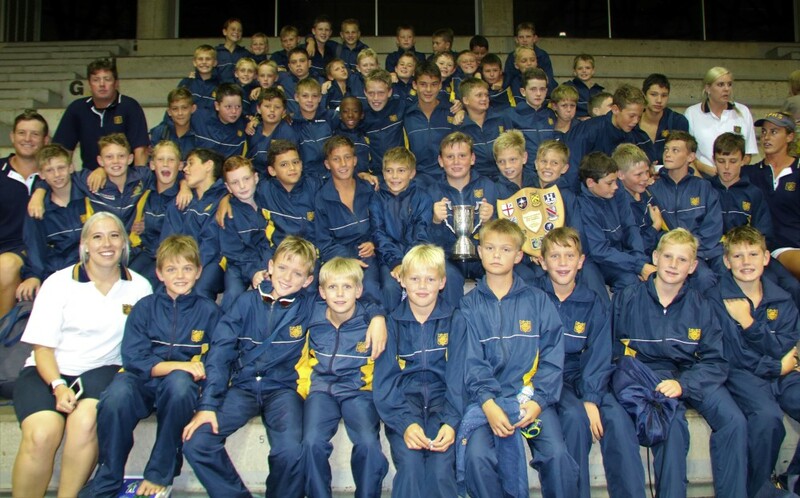 The A league Gala held on Friday night, hosted by DPHS, will be long remembered for these outstanding achievements where our B squad beat other major school’s teams and the Prep A side winning 18 out of the 20 events – this left a winning margin of 51 points between first and second place. Those Prep partners present can surely endorse how amazing these achievements and efforts are. What also added to the success of the evening was the large group of volunteer supporters who arrived as promised, in proudly Prep uniform, to cheer on their school. To see our squads celebrating with our supporters at the end will last as a fond memory of DPHS pride! Congratulations Prep – a season so far to celebrate as champions! Please note that our much valued Old Boys Association now falls under the direction of the Marketing Department at school, namely our Director Mrs Tarryn Hunter. You are reminded that all present family members and Old Boys are strongly encouraged to join and become a proud member of the Association. All members will also be receiving their ‘Association newsletter’ and information relating to DPHS events and achievements of the past term. Thanks you to all Association members for your patience during the past few months whilst this new vision and structures have been initiated. Your support as Prep partners is essential and respected. Return on Tuesday 2 April with a neat haircut of short back, sides and top of head (no ‘mop’ of hair or fancy colours/styles please). Each boy from the youngest to the oldest is expected to have had a haircut. No excuses or extensions will be accepted on return. Remember that blazers are compulsory for school during the 2nd and 3rd term for all boys from Grade 1 through to Grade 7 ie) on return from day one of the second quarter. Ensure that extra mural/sports kit is also expected to be neat and tidy with boots polished weekly. Be prepared for the polishing of the school shoes and the wearing of garters – a definite improvement has been noted across the grades. Your continued support in monitoring these Proudly Prep standards is essential and greatly appreciated – thank you. I state across all grades to families and boys at the start of the year that anti-social behaviour will not be accepted. There have been matters closely monitored and addressed relating to any form of unacceptable behaviour and I hereby again emphasize that this stance will be highlighted from day one of term 2. Thank you to those parents who have been called upon for support and for their willingness to address such issues with their son. I can confidently state that we as a team of staff have focussed our attention onto this call and that we will continue to strive for ‘happiness’ in the hearts of all partners of staff, parents and boys. The boys in the senior primary grades who achieved a top 10 academic position in their class – see the lists attached. The many boys who have earned themselves a pleasing set of results/comments as noted in their first term report. The boys who earned themselves an invitation to the ‘Headmasters Tea’ as a recipient of academic achievements announced at the Academic Assembly. The U13 boys who will be representing our school at the Glenwood High School rugby festival this weekend in this early start to the season. The 18 boys who have been acknowledged as Mr Prep during this term ie – a neatly groomed Prep Ambassador each week with one boy selected from the many contenders in the JP and SP phases. Siyabonga Jaca – Grade 5 – who has just been selected for the South African Schools Tennis Team that will be participating in the National Festival hosted during these holidays in Bulawayo. This is truly a heart-warming and remarkable achievement. All teams on the outstanding efforts and victories noted during the first term codes in the inter-school fixtures. Each Prep boy for being – “Proudly Prep”. The Mothers Committee and the many volunteers for hosting an outstanding Prep Carnival last Saturday. It was a fun-filled event with over 500 people, at least, in attendance during the event. I watched in awe at the many fun activities where our Prep boys were actively involved enjoying this end of term carnival. There was an opportunity for the boys to get wet, dirty, challenge each other, be decorated and to be well fed and refreshed with a variety of items on offer. Congratulations – thank you Chairlady Mrs Turner, the Mothers Committee and the large number of Prep families in attendance. I wish each family a relaxing and most enjoyable break from school where your family can celebrate ‘Champion’ quality time together. Rest well, have fun, be sensible and travel safely to and from your holiday destinations. Prep boys are reminded that the word ‘bored’ does not exist in their vocabulary so create ‘happy’ memories for yourself to experience and enjoy during this period.